TORONTO (January 24, 2019)— The Gershon Iskowitz Foundation in partnership with the Art Gallery of Ontario (AGO) is pleased to announce that Shuvinai Ashoona is the recipient of the 2018 GERSHON ISKOWITZ PRIZE AT THE AGO. The award, which is presented annually to an artist who has made an outstanding contribution to the visual arts in Canada, includes a $50,000 cash prize and a solo exhibition at the AGO within two years. Celebrated for her large-scale drawings, enigmatic subject matter, and collaborative work with contemporary artists, Shuvinai Ashoona is a third-generation Inuit artist living in Kinngait, Nunavut. The dramatic changes in the North—the shift from life on the land to settled communities and access to popular culture—are reflected in her art, which challenges stereotypical notions of Inuit art. 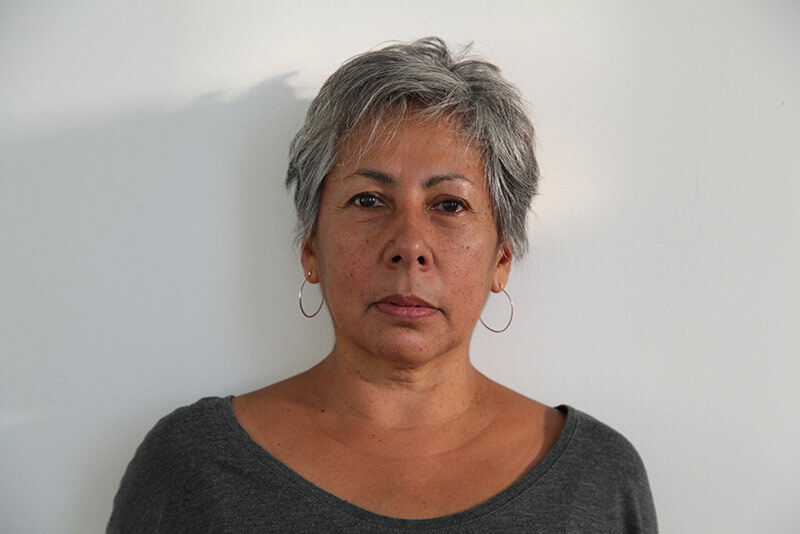 Increasingly, her constantly evolving work is included in national and international biennales and exhibitions such as Oh, Canada: Contemporary Art from North America in 2013 at the Massachusetts Museum of Contemporary Art (MASS MoCA), and Unsettled Landscapes: SITElines: New Perspectives on Art of the Americas in 2014–15 at SITE Santa Fe. Jurors for the 2018 Prize included Daina Augaitis, Chief Curator Emerita at the Vancouver Art Gallery and Independent Curator; artist and 2015 Iskowitz Prize winner Sandra Meigs; Robert Enright, Professor at the University of Guelph and Senior Contributing Editor to Border Crossings; and Stephan Jost, Michael and Sonja Koerner Director and CEO of the Art Gallery of Ontario. Shuvinai Ashoona was born in 1961 in Cape Dorset (now referred to by its original name, Kinngait). Her father, Kuiga Ashoona (1933–2014), a hunter and master carver who gained international recognition in his own lifetime, was a second-generation Inuit artist, the youngest son of the great first-generation Inuit artist Pitseolak Ashoona (c. 1904–1983). Cape Dorset had been settled only relatively recently by the time Shuvinai was ready for elementary school, and she was part of the first generation of children to attend school in the town as well as one of very few students her age in Cape Dorset who planned to attend high school in Iqaluit. The Ashoona clan, including Shuvinai and her daughter Mary, was unusual because they left Cape Dorset around 1979 and for almost a decade, lived independently in outpost camps at Luna Bay and Kangiqsujuaq, returning to Cape Dorset only for holidays or the arrival of the supply ship. 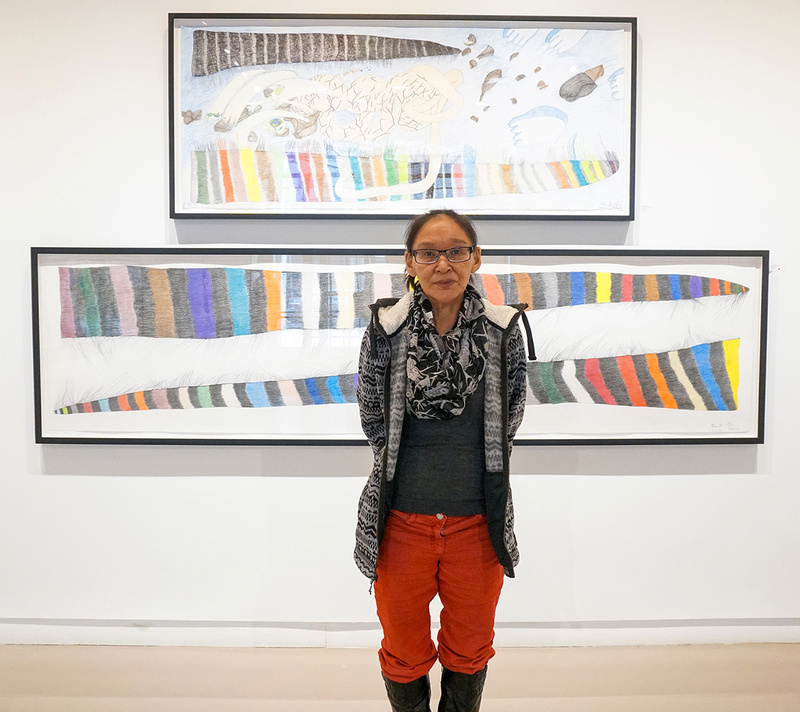 Shuvinai has been working daily at Kinngait Studios in Cape Dorset (formerly the West Baffin Eskimo Coop) for more than twenty-five years and is a major force in the development and success of the contemporary drawing practice now prevalent at the studio. She first began drawing in the early 1990s, when her younger sister encouraged her to go to the Kinngait studios. Ashoona first came to prominence in the late 1990s, when her work was included in the Cape Dorset Annual Print Collection of 1997. A few years later, alongside her grandmother, Pitseolak Ashoona and her aunt, Napachie Pootoogook, Shuvinai Ashoona’s drawings were included in Three Women, Three Generations at the McMichael Canadian Art Collection (1999). Early exhibitions of Shuvinai’s work often brought her drawings together with those of her cousins Annie Pootoogook and Siassie Kenneally, for example at the Art Gallery of Alberta, Edmonton in 2006–07. In 2008 Shuvinai worked with Regina-based artist John Noestheden to create Earth and Sky, 2008, a gigantic banner that became part of a public art installation at the Basel Art Fair and was subsequently exhibited at the 18th Sydney Biennale in 2012 and at the National Gallery of Canada in 2013 in a major international exhibition, Sakahàn: International Indigenous Art. In 2009 the Justina M. Barnicke Gallery at the University of Toronto paired two contemporary Canadian women artists—Shuvinai Ashoona and Shary Boyle in a two-person show, Noise Ghost: Shuvinai Ashoona and Shary Boyle. In the online book published by the Art Canada Institute on Shuvinai Ashoona, curator and author Dr. Nancy Campbell defined this exhibition as “creating a new conversation, challenging old assumptions about Inuit art; for example, that it should be a singular production depicting animals, birds, or fish or figures of hunters and mothers”. Noise Ghost won the Ontario Association of Art Galleries Exhibition of the Year Award. At the 20-year mark of the Prize, the Foundation formed a collaborative partnership with the Art Gallery of Ontario to raise awareness of the importance of the Prize and through it the visual arts in Canada. The AGO is home to Iskowitz’s archives, which include early works on paper, sketchbooks and memorabilia, and it holds 29 paintings by Iskowitz spanning 1948 to 1987 in its permanent collection. Beginning in 2006, in addition to a significant financial award, the Prize has included a solo exhibition of the winner’s work at the Gallery. Among the 32 previous recipients of the Prize are Liz Magor, Betty Goodwin, General Idea, Stan Douglas, John Massey, Irene F. Whittome, Françoise Sullivan, Geoffrey Farmer, Brian Jungen, Michael Snow, Kim Adams, Sandra Meigs and Rebecca Belmore. (TORONTO November 21, 2017) — The Gershon Iskowitz Foundation in partnership with the Art Gallery of Ontario (AGO) is pleased to announce that Valérie Blass is the recipient of the 2017 GERSHON ISKOWITZ PRIZE AT THE AGO. The award, which is presented annually to an artist who has made an outstanding contribution to the visual arts in Canada, includes a $50,000 cash prize and a solo exhibition at the AGO within two years. Jurors for the 2017 Prize were Stéphane Aquin, Director of the Hirshhorn Museum and Sculpture Garden; Liz Magor, artist; Philip Monk, Director of the Art Gallery of York University; and two trustees of the Foundation: Stephan Jost, Michael and Sonja Koerner Director and CEO of the Art Gallery of Ontario and collector Jay Smith. In selecting the recipient, the jury were unanimous in “being impressed by the ability of Blass’s work to spark curiosity, she engages in the history of sculpture, yet her work is very accessible. It addresses perennial challenges in sculpture while at the same time bringing new perspectives”. The group noted that Blass’s work develops through experience, not theory, and her tendency to draw upon mythical objects. An MFA graduate in visual and media arts from the Université du Québec à Montréal, Valérie Blass lives and works in Montreal. Her work first attracted considerable attention with its inclusion in the Musée d’art contemporain de Montréal’s Triennale du Québec in 2008. Significant solo exhibitions have been presented at the Musée d’art contemporain de Montréal, the Art Gallery of Hamilton and the Museum of Contemporary Canadian Art in Toronto. Recent group exhibitions include National Gallery of Canada (2017), Scotiabank CONTACT Photography Festival, Toronto (2017), La Biennale de Montréal (2016), Plug In Institute of Contemporary Art, Winnipeg (2016), Oakville Galleries, Oakville, Ontario (2016), Vancouver Art Gallery (2016), Museum of Contemporary Art Cleveland (2016), Art Gallery of Alberta (2013), Massachusetts Museum of Contemporary Art (2013). In 2012, Blass was commissioned by Public Art Fund for a year-long group exhibition at Metrotech Center, Brooklyn. Blass’s work is in the collections of the Centre national des arts plastiques, France, the National Gallery of Canada, the Montreal Museum of Fine Arts, the Musée d’art contemporain de Montréal, the Musée national des beaux arts du Québec, the Royal Bank of Canada, the Caisse de dépôt et placement du Québec and many corporate and private collections. 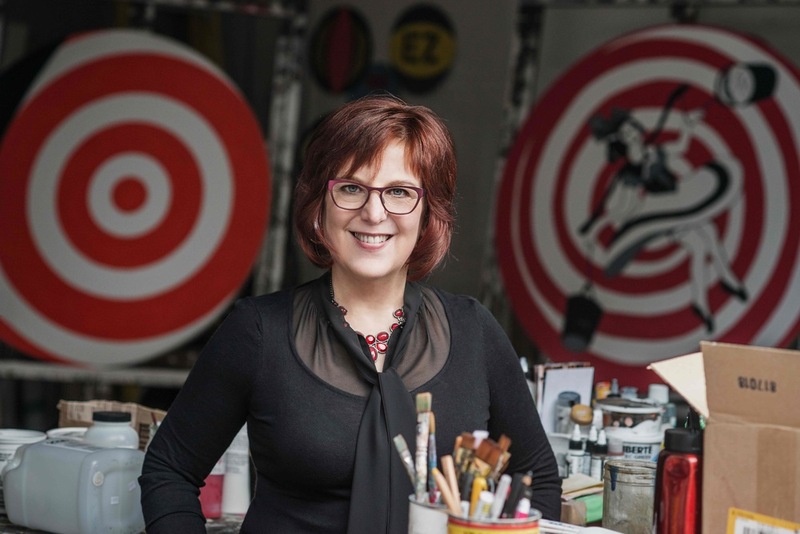 Valérie Blass was the recipient of the Prix Ozias-Leduc from the Fondation Émile-Nelligan in 2016, the Victor Martyn Lynch-Staunton award for Visual Arts in 2012, and the Prix Louis-Comtois from the City of Montreal in 2010. Thomas Bjarnason, President of the Iskowitz Foundation, noted that Valérie Blass, as this year’s recipient of the Iskowitz Prize, joins a distinguished group of contemporary Canadian artists who have won the Prize since it was first given in 1986. The jury’s decision was carefully considered and unanimous. Valérie Blass is represented by Catriona Jeffries in Vancouver. Additional details on Valérie Blass’s exhibition at the AGO in 2019 will be announced as they become available. At the 20-year mark of the Prize, the Foundation formed a collaborative partnership with the Art Gallery of Ontario to raise awareness of the importance of the Prize and through it, the visual arts in Canada. The AGO is home to Iskowitz’s archives, which include early works on paper, sketchbooks and memorabilia, and it holds 29 paintings by Iskowitz spanning 1948 to 1987 in its collection. Beginning in 2006, the Prize has included a solo exhibition of the winner’s work at the Gallery. Among the 29 previous recipients of the Prize are Liz Magor, Betty Goodwin, General Idea, Stan Douglas, John Massey, Irene F. Whittome, Françoise Sullivan, Geoffrey Farmer, Brian Jungen, Michael Snow, Rebecca Belmore and Kim Adams. Located in Toronto, the Art Gallery of Ontario (AGO) is one of the largest art museums in North America. The AGO’s collection of close to 95,000 works ranges from cutting-edge contemporary art such as Untilled by Pierre Huyghe to European masterpieces such as Peter Paul Rubens’s The Massacre of The Innocents; from the vast collection by the Group of Seven to works by established and emerging Indigenous Canadian artists; with a photography collection that tracks the impact of the medium with deep holdings of works by artists such as Garry Winogrand and Diane Arbus; and with focused collections in Gothic boxwood miniatures and Western and Central African art. Drawing on this collection—as well as collaborations with museums around the world—the AGO presents wide-ranging exhibitions and programs, taking special care to showcase diverse and underrepresented artists. A major expansion designed by Frank Gehry in 2008 with lead support from the family of Ken Thomson makes the AGO a highly-photographed architectural landmark. Visit ago.ca to learn more. The Art Gallery of Ontario is funded in part by the Ontario Ministry of Tourism, Culture and Sport. Additional operating support is received from the City of Toronto, the Canada Council for the Arts and generous contributions from AGO members, donors and private-sector partners. TORONTO (November 16, 2016) — The Gershon Iskowitz Foundation in partnership with the Art Gallery of Ontario (AGO) is pleased to announce that Rebecca Belmore is the recipient of the 2016 GERSHON ISKOWITZ PRIZE AT THE AGO. The award, which is presented annually to an artist who has made an outstanding contribution to the visual arts in Canada, includes a $50,000 cash prize and a solo exhibition at the AGO within two years. Rebecca Belmore’s exhibition and performance history is extensive, both across Canada and internationally. As an indigenous artist, Belmore responds in a way that is very cognizant of where she is; as one juror remarked, her “practice remains a contestation”. She pushes conversations and questions institutions for all the right reasons. Highly respected as a performance artist, the initial seeds of her artistic inquiry appear as early as 1988 in Artifact #671B — in support of the Lubicon Cree against the Olympic Flame celebrations—and they continue to this day. Belmore’s work has huge scope and complexity, as seen in her installation of a massive blanket of beads for the Canadian Museum of Human Rights or the video installation The Blanket. Solo exhibitions have included Kwe at the Justina M. Barnicke Gallery at the University of Toronto, Rising to the Occasion at the Vancouver Art Gallery, Fountain at the Canadian Pavilion of the 51st Venice Biennale, and The Named and the Unamed at the Art Gallery of Ontario. The scope of Belmore’s participation in group exhibitions indicates the depth and breadth of her practice, with in the coming year dOCUMENTA 14 in Athens and Kassel, Germany and LandMarks 2017 at various National Parks in Canada, Theatre of the Brave, A Symposium of Indigenous Performance Art at the IAIA Museum in Santa Fe; Oh, Canada at MASS MoCA, It is What It Is at the National Gallery of Canada, and the Sydney Biennial. Rebecca Belmore’s work is in the collections of the National Gallery of Canada, the Art Gallery of Ontario, The Mendel Art Gallery, the Minneapolis Institute of Arts, Art Bank of Canada, the Hood Museum, Thunder Bay Art Gallery and private collections throughout Canada and the USA. Jurors for the 2016 prize included Barbara Fischer, Director of the University of Toronto Art Centre and curator; Peggy Gale, Foundation trustee and independent curator, writer and editor; Stephan Jost, Michael and Sonja Koerner Director and CEO of the Art Gallery of Ontario; and Reid Shier, Director/Curator of Vancouver’s Presentation House Gallery and the future Polygon Gallery. More details about Rebecca Belmore’s exhibition at the AGO in 2018 will be announced as they become available. Members of the jury encouraged consideration of expanding the medium, as Belmore does, and the exhibition itself beyond the institution. Born in Upsala, Ontario in 1960, Belmore attended the Ontario College of Art and Design from 1984 to 1987 and was honoured by an Honorary Doctorate from OCAD in 2005. Belmore was awarded the Governor General’s Visual Arts Award in 2013 as well as the Lynch—Staunton Award in Media Arts in 2005 and the Hnatyshyn Foundation Visual Arts award in 2009. She currently resides in Montreal. At the 20-year mark of the Prize, the Foundation formed a collaborative partnership with the Art Gallery of Ontario to raise awareness of the importance of the Prize and through it the visual arts in Canada. The AGO is home to Iskowitz’s archives, which include early works on paper, sketchbooks and memorabilia, and it holds 29 paintings by Iskowitz spanning 1948 to 1987 in its collection. Beginning in 2006, the Prize has included a solo exhibition of the winner’s work at the Gallery. Among the 29 previous recipients of the Prize are Liz Magor, Betty Goodwin, General Idea, Stan Douglas, John Massey, Irene F. Whittome, Françoise Sullivan, Geoffrey Farmer, Brian Jungen, Michael Snow and Kim Adams. With a collection of more than 90,000 works of art, the Art Gallery of Ontario is among the most distinguished art museums in North America. From the vast body of Group of Seven and signature Canadian works to the African art gallery, from the cutting-edge contemporary art to Peter Paul Rubens’ masterpiece The Massacre of The Innocents, the AGO offers an incredible art experience with each visit. In 2002 Ken Thomson’s generous gift of 2,000 remarkable works of Canadian and European art inspired Transformation AGO, an innovative architectural expansion by world-renowned architect Frank Gehry that in 2008 resulted in one of the most critically acclaimed architectural achievements in North America. Highlights include Galleria Italia, a gleaming showcase of wood and glass running the length of an entire city block, and the often-photographed spiral staircase, beckoning visitors to explore. Visit ago.net to find out more. 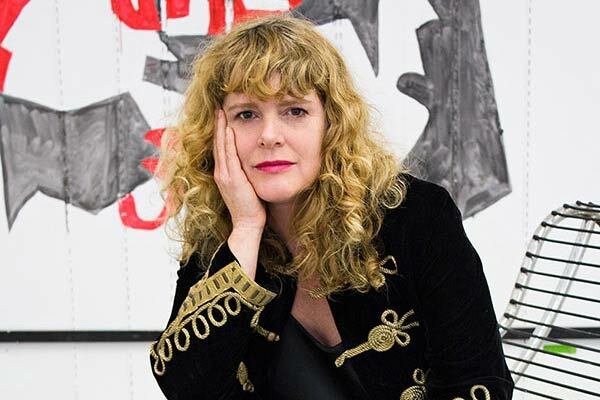 TORONTO (Oct. 29, 2015) — The Gershon Iskowitz Foundation in partnership with the Art Gallery of Ontario (AGO) is pleased to announce that Victoria-based artist Sandra Meigs is the recipient of the 2015 GERSHON ISKOWITZ PRIZE AT THE AGO. The award, which is presented annually to an artist who has made an outstanding contribution to the visual arts in Canada, includes a $50,000 cash prize and a solo exhibition at the AGO, coming in 2017. Sandra Meigs’ work has been described as expressive, eclectic and interdisciplinary; her paintings are known for their unique approach in combining complex narratives with comic elements in large scale works such as The Basement Panoramas andStrange Loop. She is dedicated to painting and refers to the possibilities of enchantment that painting presents through colour and form. For Meigs the very authenticity of one’s experience offers proof that what is imagined when looking at a painting is as real as anything else that one experiences in the world. In addition to painting, she has also woven sculpture, film, sound, and other media in her works. A recipient of a Governor General’s award in 2015, Meigs’ exhibition history is extensive, with over 40 solo and 60 group exhibitions in Canada and abroad. Solo exhibitions include Mercer Union and The Power Plant, Toronto, the Art Gallery of Greater Victoria, the Musée Regional de Rimouski, Carlton University Art Gallery, Ottawa, Contemporary Art Gallery, Vancouver and the Musée des Beaux arts de Montreal. Group exhibitions have included the Sydney and Bologna Biennales, the National Gallery of Canada, Walter Phillips Gallery in Banff, the Vancouver Art Gallery, the Art Gallery at UQAM, Montreal and The Ydessa Hendeles Foundation, Toronto. Meigs’ work is in the collections of the National Gallery of Canada, the Art Gallery of Ontario, the Banff Centre, the Canada Council Art Bank and the Musée d’art contemporain de Montreal as well as private collections. More details about the Meigs exhibition at the AGO in 2017 will be announced as they become available. Born in Baltimore in 1953, Sandra Meigs studied at the Rhode Island School of Design, the Nova Scotia College of Art and Design (B.F.A. 1975) and Dalhousie University (M.A. 1980). She has lived and worked in Canada since 1973 and for the past 23 years has taught in the Visual Arts Department of the University of Victoria. Meigs is represented by the Susan Hobbs Gallery in Toronto which has presented her installation and painting projects since 1993.